Simultaneous application of XADO AMC Maximum SUV and fuel system cleaner Atomex Multi Cleaner gasoline) allows avoiding major problems with reduction of engine power and increasing of fuel consumption! Even being treated with XADO AMC Maximum SUV restored engine may not show the nominal characteristics of engine power and fuel consumption because of using low-grade fuel. Sometimes 120 miles of run on poor fuel is enough to make clogged injectors and carburetors stop distributing fuel effectively. As consequence this leads to engine power loss and acceleration decline, and fuel consumption increases. 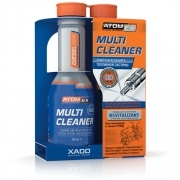 Applying Atomex Multi Cleaner each 3000 miles will completely clean the entire fuel system from contaminations and will restore normal operation of injectors and carburetors. Applying these two products together will allows you achieving maximum performance out of your vehicle! Simultaneous application of XADO AMC Maximum and fuel system cleaner Atomex Multi Cleaner allows avoiding major problems with reduction of engine power and increasing of fuel consumption! Even being treated with XADO AMC Maximum restored engine may not show the nominal characteristics of engine power and fuel consumption because of using low-grade fuel. Sometimes 120 miles of run on poor fuel is enough to make clogged injectors and carburetors stop distributing fuel effectively. As consequence this leads to engine power loss and acceleration decline, and fuel consumption increases. 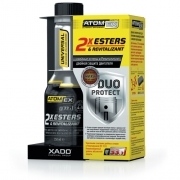 Applying Atomex Multi Cleaner each 3000 miles will completely clean the entire fuel system from contaminations and will restore normal operation of injectors and carburetors. Applying these two products together will allows you achieving maximum performance out of your vehicle! Very happy with this product Well recommend as allways The xado products are impressive. Very happy with the product. I put the full treatment into 33lt of petrol and after 150 miles toped it up. Car has not had a good drive for over 6+months and is now sweet very smooth. Just had a oil change + tune up added. My MPG is getting better than new. I have had a drive in a same car as my Suzuki Ignis and feels very lack luster. Recomended it to every one. This is a product I have never heard of, but their logo was emblazoned all over a Mazda MX5 at the MX5 Supercup at Silverstone last weekend. The name XADO certainly caught my eye and the fact the Xado car won made me look it up upon my return home. Not knowing what to try I called Xado UK who suggested the Xado Maximum Metal Conditioner and the AtomEx Petrol Multi Cleaner. My wife's car is a Range Rover Coupe Evoque 2.2 with quite a few miles on the clock. Xado UK were very helpful. The technology sounded convincing so I ordered both items, which arrived the next day. 3 weeks after adding the products I am extremely impressed. No wonder the guy in the Xado MX5 won. This product certainly packs a punch. I came across Xado via my local VW car club. Several of the members had used various Xado products and each member reporting good results. Always the sceptic I thought I would give it a go. 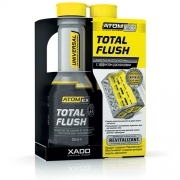 The Xado AtomEx Perol Engine Multi Cleaner arrived swiftly, well packed with easy to understand instructions. 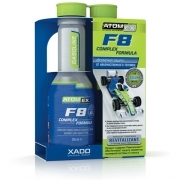 Most of Xado products were added to the oil, but this product is added to the fuel tank at refill. I had been experiencing performance issues - low MPG and patchy acceleration. The Xado AtomEx diesel multi cleaner seemed to do the trick. My acceleration dead spots have gone and the engine is definitely running better. Others at our club have been watchign and we are all impressed with the results. This is certainly not another Snake oil! !